Kickstarter called 2012 “the year of the game,” and with the number of successfully funded board game projects this year, that moniker seems apt. But it’s not just the funding that’s happening in 2012: the games are rolling out as well, and Garden Dice is one of the newest available from this crop. But is it worth grabbing your spade or hoe? Check out the review below! 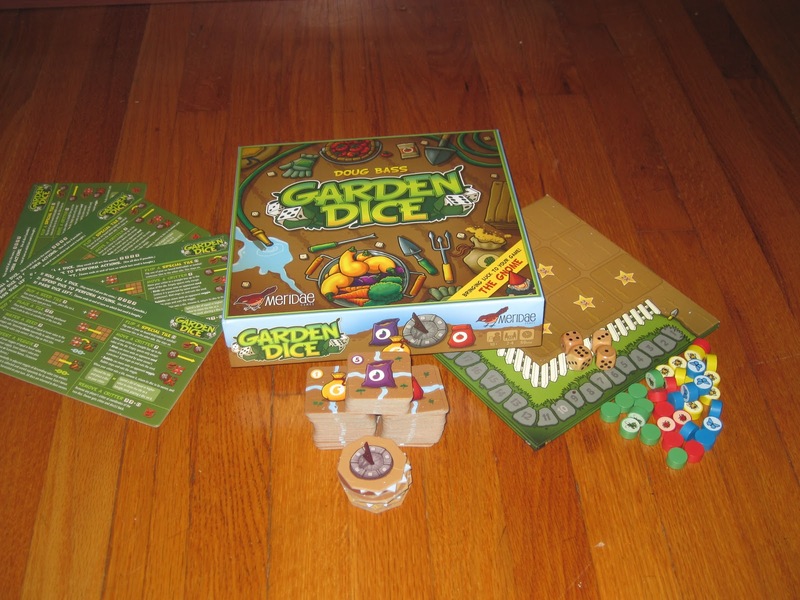 Garden Dice is a dice rolling and allocation game for two to four players that plays in around an hour. Chaining in action. Watering the bottom eggplant (purple tile) would water everything except the top eggplant and rightmost artichoke tile. Watering the left artichoke (green tile) would water the top tomato and bottom right carrot. Because the primary source of points is harvesting plants from the garden, the main actions of the game are buying, planting, watering, and harvesting seed tiles. The interesting thing here is that watering and harvesting are chained. That is, if you water or harvest one of your seeds or vegetables, any orthogonally adjacent seeds/vegetables of a lower value are also watered/harvested, as are any seeds/vegetables orthogonally adjacent to those, and so on. So planting seeds in chains–even opponents’ chains–becomes a key point of strategy. And when you harvest another player’s vegetable on your turn, you score one point for each vegetable harvested (so piggybacking isn’t all bad). There are also some special tiles, which offer ways to mitigate bad rolls, modify points scored, and interfere with opponents’ plans. The sun tile may be discarded to completely reroll a turn or to change one die to whatever a player wants it to be. (An unused sun tile at the end of the game is worth points, though, so it’s best to avoid using it unless you must.) 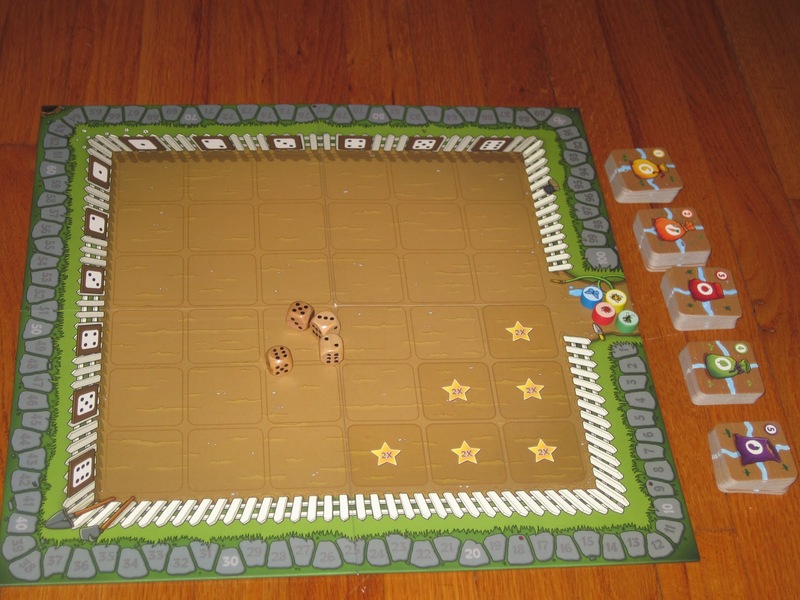 The sundial tile allows a player to modify his coordinate dice by a total of two pips–either altering one die by up to two or both dice by up to one. The four spaces in the highest coordinate corner score double points for vegetables harvested on them, and the scarecrow tile makes each adjacent tile score extra points. The critter tile allows its controller to destroy opposing seeds or vegetables (which can be costly: it requires using a player marker). Once all of the seeds have been purchased, the game ends. 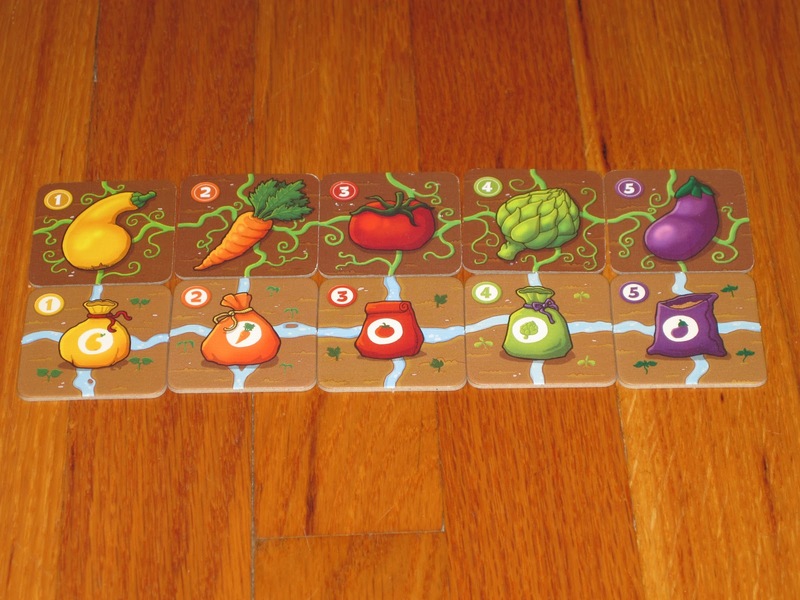 Players lose points for unplanted vegetables and score points for having collections of the same and sets of different vegetables. Whichever player has the most points is the winner. Kickstarter has taken flak–much as self-published books have–for lowering the barrier to entry, allegedly allowing the release of games before they are fully baked. I’ve fallen prey to this way of thinking at times, which is why a release like Garden Dice is so refreshing. Not only does it have remarkably good production values (up there with some of the best in the industry), it has the (mostly) polished rules and mechanics to undergird them. First, the components. The art in Garden Dice is fantastic. The game looks great when it’s on the table, which goes a long way toward making others interested in playing it. The design of the game naturally directs players to follow the rules, and it is easy for players to see what options are available to them. Additionally, the game comes with a useful two-sided player aid for each player that lays out the flow of the game as well as final scoring parameters. The tiles and player aids are on thick cardboard, and while they don’t make the gratifying clack of Carcassonne tiles, they seem of a similar sturdy quality. 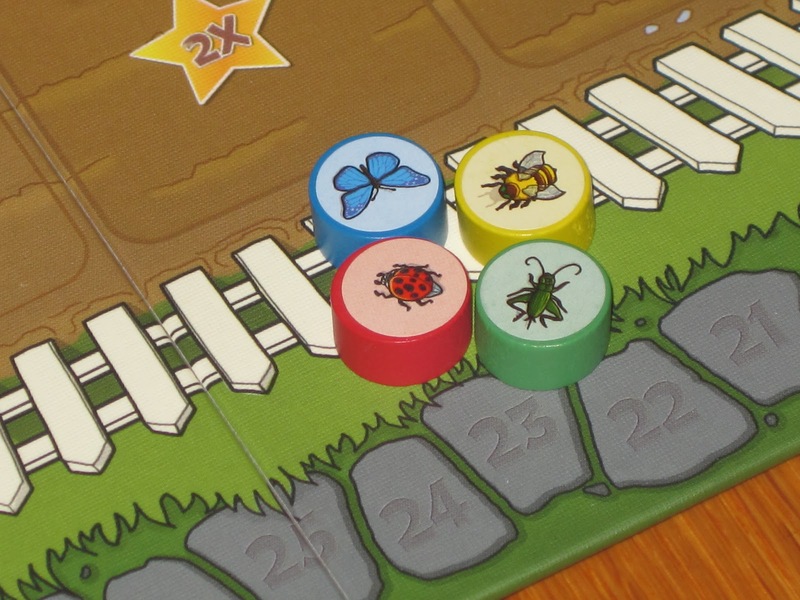 The player tokens are wooden discs, and the game comes with a completely superfluous (but evocative) sheet of stickers, making each player’s discs into a different garden bug. The dice are wooden as well. 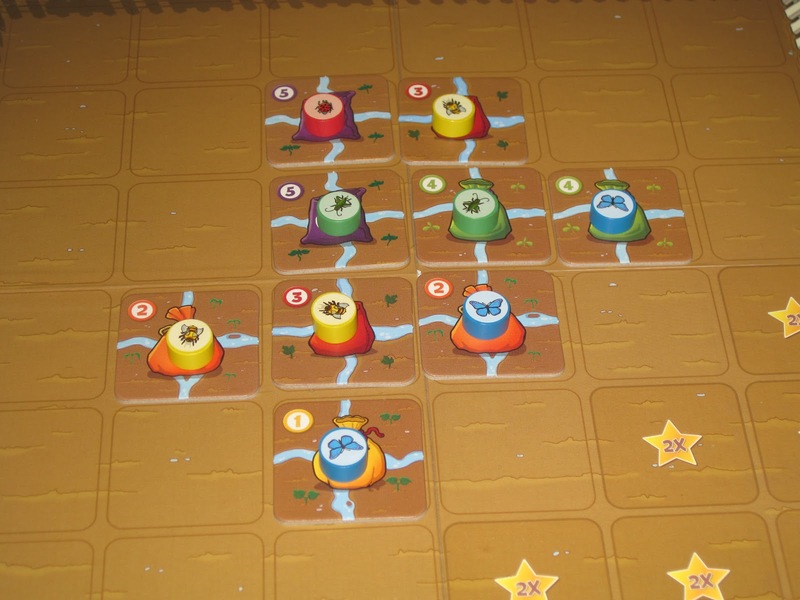 Garden Dice is a dice game with lots of strategy and surprisingly little luck. As a Euro fan, it’s no surprise that dice games usually don’t do it for me–and this despite the fact that I love the tactile nature of rolling dice! Dice games of the Yahtzee variety (even souped up ones like Roll through the Ages or King of Tokyo) aren’t my favorite because of a heavy reliance on luck. On the other end of the spectrum, a game like Troyes, which I do enjoy (albeit infrequently, as finding opponents is difficult), is a little too meaty for general consumption. I think Garden Dice occupies a similar niche to Stone Age, only with a more interesting core mechanism: the dice determine which actions you can take. The game set up for four. Dice determine actions? This seems like it would reduce the amount of strategy, not open it up. But Garden Dice fixes this problem by offering a wealth of actions, some of which require (or are optimized by) even the lower numbers rolled. Because the board is a 6×6 grid, you can usually find somewhere to plant your seeds. And planting all of the highest-valued vegetable seeds isn’t necessarily the best strategy. It’s true that each eggplant harvested nets a player five points, but eggplants don’t chain: they aren’t a lower value than anything. It can behoove a player to buy the lower-valued tomatoes, carrots, and squash because these are easier to harvest on other players’ turns. And while it may seem like a waste to purchase them with a higher die roll, they’re the perfect buy when you don’t know what else to do with your dice actions. There is certainly luck involved, but I’ve not felt hamstrung by my bad rolls or overly fortunate in my good ones. 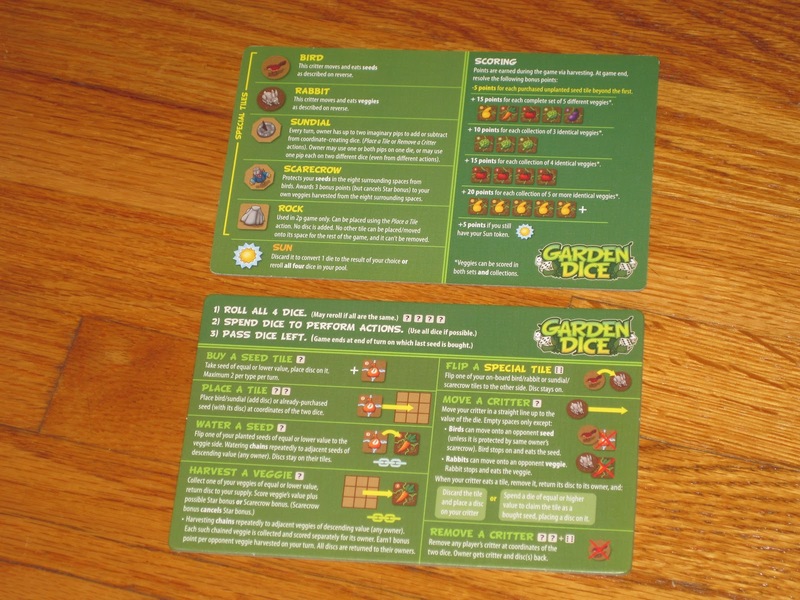 Another positive for Garden Dice is that it works with all configurations of players on the box. While the game is different with two, three, or four players, it works with all of them. I can play the game peacefully with just my wife as we cultivate our vegetables; I can play the game more competitively over lunch with my coworkers. And while the game is on the higher end of the 60-minute projected game length, it fills it pretty well–certainly better than some other dice-based Euros (yes, I’m looking squarely at you, Kingsburg the Dull). I should mention, though, that the game lasts about the same amount of time no matter how many players are at the table. I think Garden Dice lasts just a little long with two players; it’s the perfect length with a full table. The game comes with helpful, two-sided player aids for each player. That being said, there are a few things about Garden Dice that I’m not sure about. First is the critters. I’ve explained them each time I’ve introduced the game: how they work, what they do. I’ve played with usually peaceful groups and with usually bellicose groups, and no one has bothered to place their critter on the board. In my last game, I asked why no one played their critter tile, and the response was that it used up dice actions and didn’t seem worth the investment. I pointed out some instances when a critter’s use might be worth it, but my fellow players said (and I agreed) that optimal use seemed mostly situational. Of course, on the other hand, I have one friend who, no matter the game (even co-ops! ), likes to play the role of warmonger. While I didn’t play Garden Dice with him, I can imagine him relishing nabbing other players’ vegetables and seeds. So I guess for the critters, it depends on your play style and what you want out of the game. For my taste, I think the game works fine without them (and I myself didn’t see much value of using them during the game). Similarly, no one has ever used the sun token. I’m sure there was some player along the line who rolled terribly and suggested this addition, but I think making the best of what you roll is part of the appeal of the game. Anyway, I suppose it’s a decent addition for the one time you really need it, but like the critters, its use feels very situational to me, adding unnecessary complexity. In the same vein, while as a gamer I liked having a wealth of options on my turn, I think these could be overwhelming for more casual gamers. Most of the people I played with caught on to the game quickly (they’re used to me bringing strategic games to the table), but I would take the 10+ age range on the box seriously. While Garden Dice is in most ways a family game, I think it will be harder for younger players to catch on. The player aid, while helpful, is also a bit overwhelming at first blush, especially considering that the buy, place, water, and harvest actions are the most frequently used. (The others all pertain to the special tiles.) A cursory look at the player aid makes the game look more complex than it is. 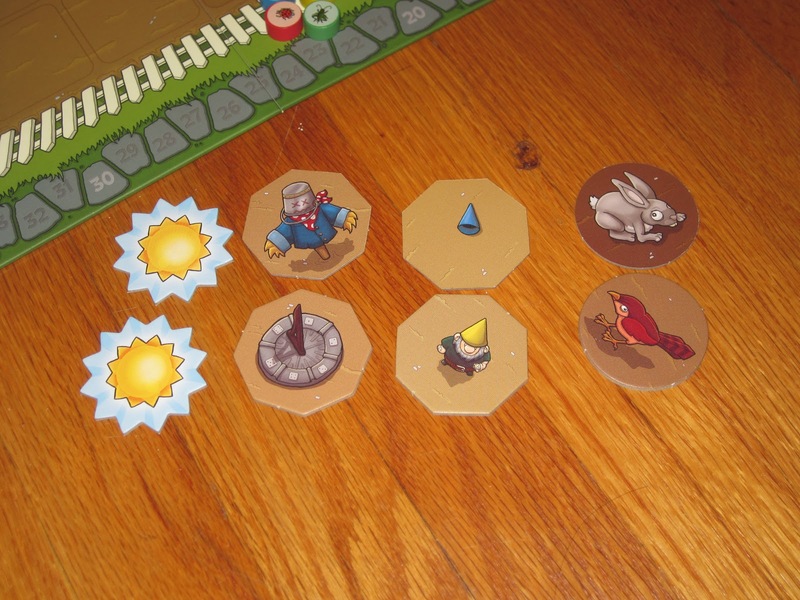 The player tokens. The stickers are superfluous bling, but I think they really add to the flavor of the game. But really, these “issues” are small and nitpicky. Garden Dice looks pretty, serves as an excellent introduction to Euro-style dice mechanics, and plays smoothly, all within an hour timeframe. More than this, the game is fun. I like the challenge of using the dice to form a plan, and I love the idea of dice-based coordinates. Garden Dice fills a gap somewhere between Carnival (which is a very light and introductory dice-allocation game) and Yspahan. It has a very simple ruleset (with some small details that might hiccup less experienced game players), yet it offers a good breadth of strategic options. I highly recommend that you check out Garden Dice, one of the best of the Kickstarter harvest I’ve seen. I don’t think you’ll be disappointed you did. iSlaytheDragon would like to thank Meridae Games for providing us with a copy of Garden Dice for review. I should mention that the rulebook suggests removing the bird/rabbit tiles for the family game.